On October 23, 2007, the U.S., E.U., Canada, and a handful of other countries announced plans to the negotiate the Anti-Counterfeiting Trade Agreement. The behind-the-scenes discussions had apparently been ongoing for several years, leading some countries to believe that a full agreement could be concluded within a year to coincide with the end of the Bush administration. Few paid much attention as the agreement itself was shrouded in secrecy. ACTA details slowly began to emerge, however, including revelations that lobby groups had been granted preferential access, the location of various meetings, and troubling details about the agreement itself. As the public pressure mounted, the talks dragged along with participating countries increasingly defensive about the secrecy and the substance. ACTA was ultimately concluded in 2010 – years after the initial target – and some of the most troubling provisions were abandoned. Yet the final agreement still raised serious concerns, both for the way the agreement was concluded as well as for the substance. When ACTA was formally signed by most participants in October 2011 in Tokyo, few would have anticipated that less than a year later, the treaty would face massive public protests and abandonment by leading countries. But with tens of thousands taking to the streets in Europe earlier this year, ACTA became the poster child for secretive, one-sided IP agreements that do not reflect the views and hopes of the broader public. 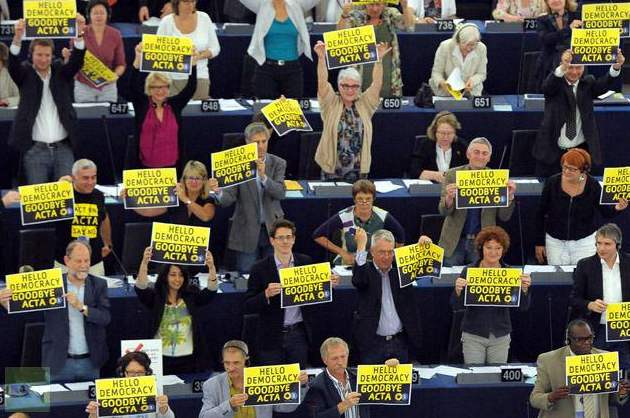 This morning, the European Parliament voted overwhelmingly against the agreement, effectively killing ACTA within the EU. The vote was 478 against, 39 in favour, with 165 abstentions This is a remarkable development that was virtually unthinkable even a year ago. Much credit goes to the thousands of Europeans who spoke out against ACTA and to the Members of the European Parliament who withstood enormous political pressure to vote against the deal. The EU & India comprise two markets totaling approximately 1 700 000 000 people. I don’t think it can be claimed that ACTA is bringing Canada in line with IP rights and piracy laws to comply with international markets, any more. It is only a few hours too late…thanks to our corrupt government! Today is my 25th Wedding anniversary, they found the Higgs (probably) and now ACTA is about as potent as toilet paper. Next in line, the TPP! It’s now time to attack the even more secretive TPP, which under the guise of a trade agreement is nothing more than another way to subvert democracy. This monday, after a conference in Spain with Lawrence Lessig, we were feeling quite depressed by the impotence to bring positive change in the light of political systems that spoil any decent idea or movement. And suddenly there is finally some evidence of the Higgs Boson, and more importantly ACTA is dead an buried. Industry lobbyists should find dig themselves a hole now!!! what will people of USA do ? now people of EU have won. what will people of USA do against ACTA ? People, TPP is indeed just as horrible but let’s not forget CETA, Comprehensive Economic trade agreement between the EU and Canada. We should write (and I already sent off e-mails) to Greens/EFA MEPs why they would have, in their names, our copyright *extended by 20 years* when they themselves support a copyright limited to a *total of 20 years* after publication. The Europeans themselves should worry about the IPRED ‘refresh’. Today is a day of celebration and reflection. This battle was fought hard (Europeans taking to the streets in mid-winter) and won. Tomorrow, the war continues. Certainly hacking, cracking and sharing is one response to the **AA but might I suggest instead just not buying their stuff? There are many worthy artists who have thrown off the shackles and care about their fans … support them instead. Crockett, I’m happy to extend your analogy by saying that ACTA has reached the fullness of used Toilet PaPer. The hope of the USTR has been that ACTA could be ratified without going to Congress. It can have no certainty in a Congress whose fingers were already burned over SOPA/PIPA, where they were previously clueless about any possible opposition. One positive outcome has been a general public awareness about international trade agreements, and their pervasive effects on personal lives. Harper never actually listens to what the people want. Internet should be open and free. Downloading and sharing is an important part of that. linking is legal,(good) the root servers stay stateside, (bad), the pacific free-trade agreements are getting signed (bad for manufacturing, good for intellectual-prop exporters), parody is legal, and breaking locks get heavier penities than killing people. Onward. Lets get fox news off the air. Well good for the EU, they have some God looking over them. I’m truly proud of the stand they’ve taken against this US driven legislation. Unfortunately this does not one bit of good for us here in Canada. I’m convinced, we’re lead by Satan himself and his various sub-demons. Canada is totally screwed until Harper and his goons are are dealt with!! Perhaps Harper will do away with elections next and appoint himself “Fearless Leader”, it’s just as well since he’s already gutted democracy. Perhaps he’ll earn his rightful place in history books…as the most corrupt PM in Canada’s history. One would think that a number of industries for whom ACTA was originally crafted to prevent counterfeiting of designs and drugs must be getting truly pissed off that they ever allowed the music, movie and publishing industries to get their size 13 foot in the door. Most of these things are failing because of completely unreasonable demands from that sector.